Living on a peninsula can present some interesting challenges. 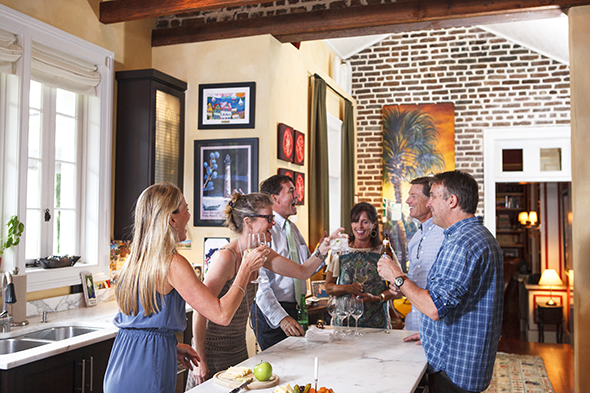 As Charleston residents, we will forever be hemmed in by the natural boundaries of two rivers. 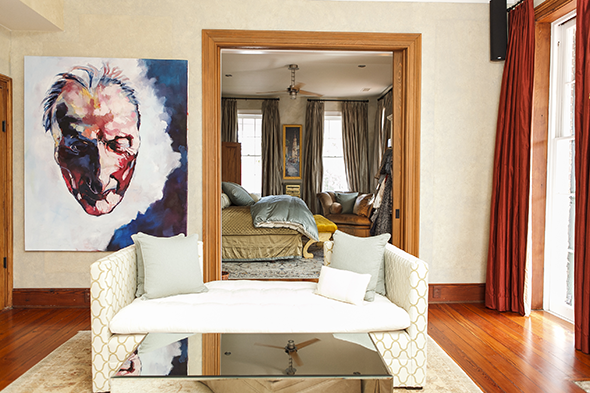 Downtown homes can offer similar challenges for art collectors. Mike and Michele Seekings developed guiding principles to help them navigate narrow waters. “When we started collecting, we lived in a much, much, much smaller house when we first were married…and we didn’t have much in the way of wall space,” Michele says. Setting parameters can be a helpful tool when you lack space. “Our whole goal is to support local art…our collection is all local artists; that is our direction and what we focus on,” she says. 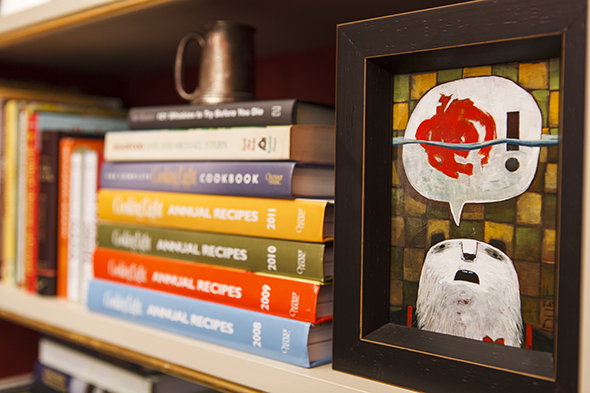 They purchased small works to fit the confines of the house. 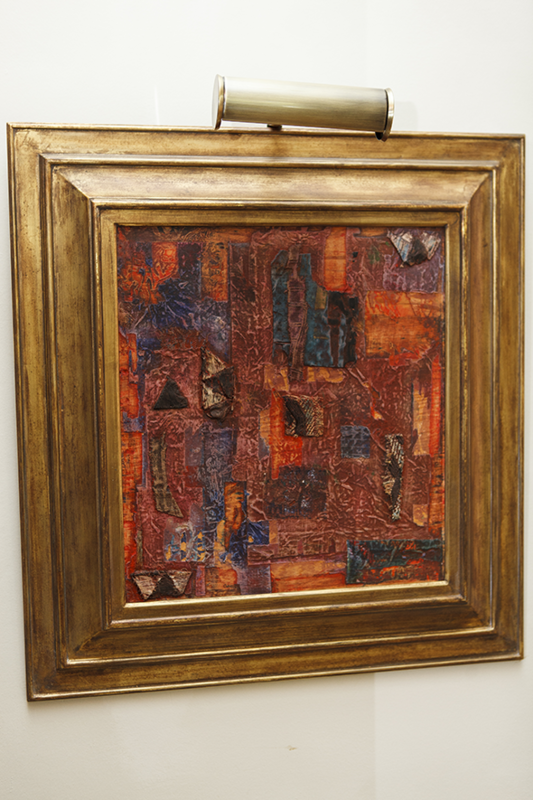 One of the first meaningful pieces they purchased as a couple was a painting by Fred Jamar of their first home, and from there a great friendship blossomed. A quick glance around the house confirms that they must be one of Jamar’s biggest collectors. 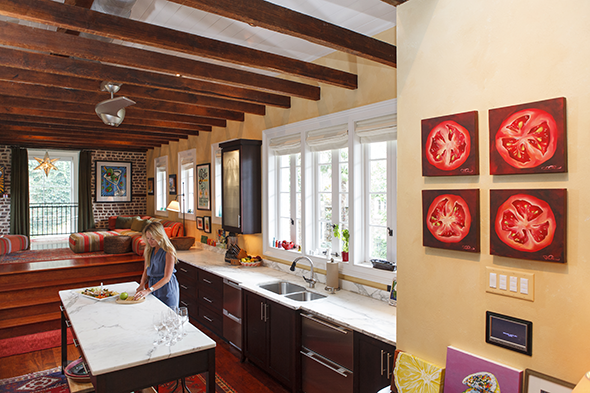 “We wanted to put our own spin on the house, plus we had to do a lot of renovation,” Michele says. All the walls were white, very contemporary. Michele describes their style as a mix, more eclectic. 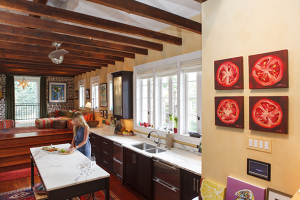 At the start of their project, Mike and Michele approached an artist friend to see if he would even be interested in working on their renovation project. 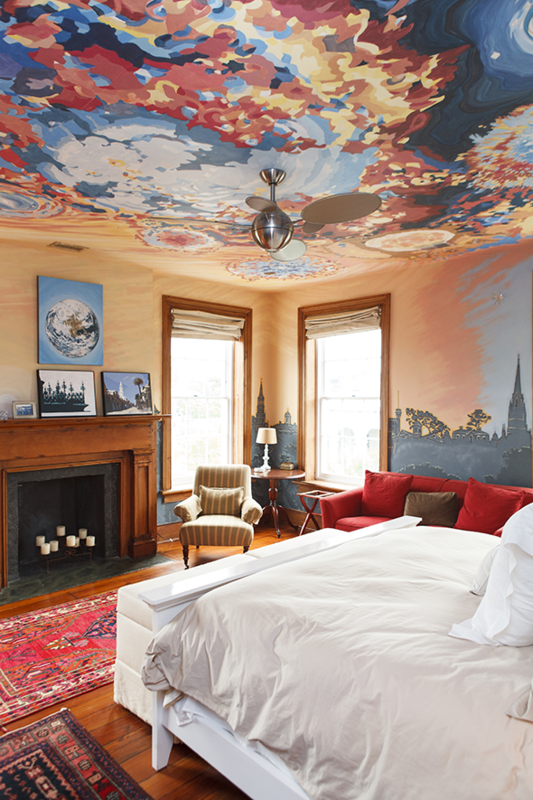 “So all the decorative painting is by one of our dearest friends, Karl Beckwith Smith. Anything that has paint on it is Karl.” He’s been working with the Seekings since day one, and they credit much of the success of their home to him. Every room in the house bears his fingerprint. Smith’s artwork was more traditional when they began working together, but collaborating with the Seekings encouraged Smith to explore a more contemporary style; in return he helped them break out of their own comfort zones. “Karl is a wonderful, wonderful human being. Karl’s like a family member,” Michele says. He is an integral part of their collection, their home, and their lives. 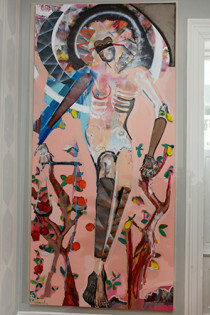 They have commissioned several artists to create work for specific spaces in their home. Karl Beckwith Smith. Tim Hussey. Fred Jamar. Ben Hollingsworth is another. “We didn’t tell him what we wanted, we just said ‘hey, do something cool there.’” Hollingsworth created a larger than life interpretation of Lady Justice in homage to Mike’s profession; it stops all their visitors in their tracks. They’ve developed a relationship with Hollingsworth. In the living room hangs a stunner by William Halsey (1915-1999). “We were very proud. It’s our premier piece. That would have actually fit in our old house!” Michele laughs. Brian Rutenberg is the only artist that they don’t have a personal relationship with, but he is from the Lowcounty, there is a Gibbes Museum connection, and they simply love his work. 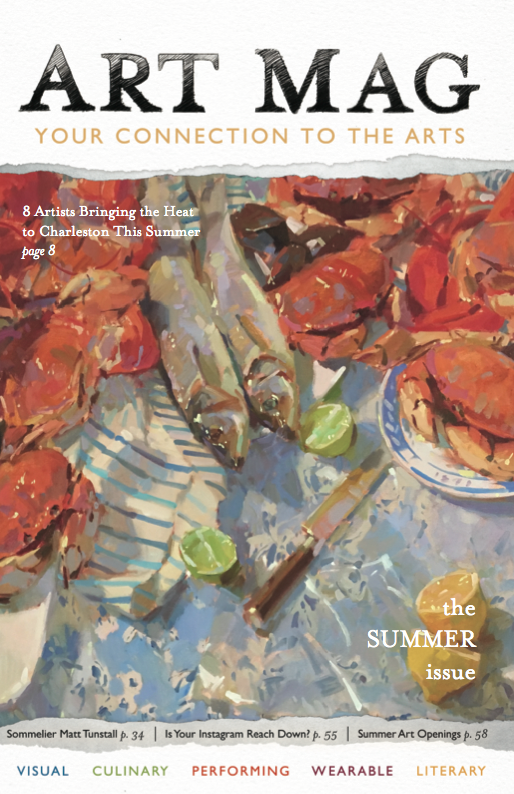 “We saw this in New York at the Forum Gallery, and said, ‘OK, That’s Brian Rutenberg, and we love it, and…we have to have it!’ So, I guess one of my goals is to meet Brian Rutenberg one day,” she laughs. Timmy Pakron is another artist they keep up with. They met him through Ben Hollingsworth, when he was taking reference photos for Hollingsworth. Pakron brought his own work for the Seekings to see, helped Michele begin cataloging their collection, and even convinced Michele to sit as the model for his interpretation of The Last Supper that was displayed at the City Gallery. One of his portraits of Michele hangs in their hallway. Next to one of Pakron’s works is a prominently displayed print by Lindsay Windham, with the message “Bike Like You Give A Damn,” which they acquired at the Redux Art Auction. “We’re trying to mesh variety of style and variety of media,” she says, plus the message resonates with them as avid bike riders and runners. Photographs by Brianna Stello are hung throughout; some are meaningful photographs from their first home and others acquired since they moved to their current home. “Brianna is one of my dear friends…she was my first friend in Charleston, when I moved here,” Michele says. “We have a couple Nathan Durfees, and this one does have a story—Michael went toe to toe with someone at the Redux Art Auction for this, our first piece…I still have the paddle, we got him to sign it.” Durfee not only signed their winning paddle but did a little doodle on it, which they have saved to this day. Mike and Michele both come from military families, aviators in fact—they even met through flying. Mike was getting his instrument rating; Michele’s nephew was his flight instructor. He introduced them, and the rest is history. “If we both don’t agree, we don’t buy it. We already had similar taste; we weren’t on polar ends opposite of the spectrum. Michael didn’t want dog and duck pictures, and I didn’t want contemporary pictures. 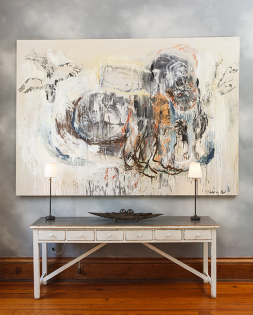 Our decorating style and art style are similar…it doesn’t get pursued if we both don’t go, ‘yeah.’ It’s an investment, and we both have to see it,” says Michele. “Michael would be more inclined to buy something on a whim, like these,” two lovely illustrations by Kristen Solecki that he found at an art show at the Flagship Digital Corridor. They are fans of Tate Nation, who they met through the running scene; not only do they think he’s a great guy, but his bright colors work well in their kitchen. 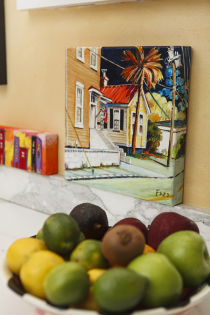 “We met Honor Marks through Karl and became fans of her;” Marks’ food-centric canvases are throughout the kitchen. There are more Fred Jamars, a Jay Fletcher Charleston gates screen print, two works by Burton Morris, and more in the kitchen. Morris is the only non-local artist, but they have a personal connection with him through Mike’s brother. 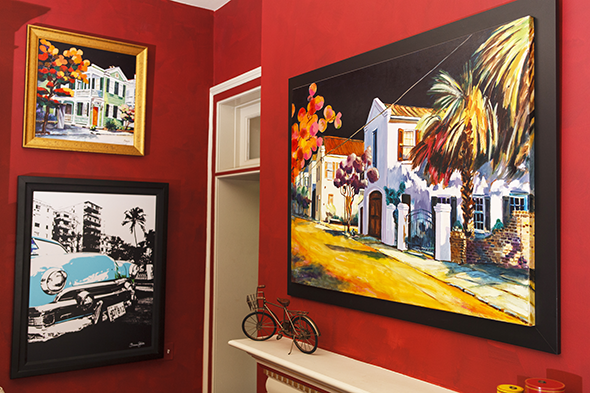 More Fred Jamar paintings are sprinkled throughout the house. They hosted a Gibbes Museum Society 1858 event featuring Fred Jamar at their home. “We were hanging Fred’s work all over the place and realized we kind of really liked it there.” ‘It’ being one of Jamar’s large-scale light pole cutouts with ropes that span across the stairwell, reaching towards a David Boatwright painting that was rescued when Raval wine bar closed, and a Shepard Fairey print from his 2014 exhibition at the Halsey Institute of Contemporary Art. All the ironwork is by Sean Ahern of Ahern’s Anvil—the stairwell railings, the incredible living room and dining room chandeliers, and two freestanding sculptures. Word to the wise: the Seekings are looking to add more sculpture and three-dimensional art to their collection, a goal they are still eager to meet. They enjoy entertaining, inviting friends and artists to mingle. 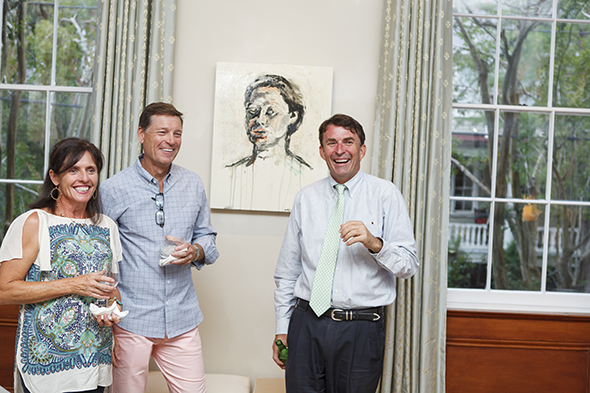 “When we have big parties, we hang art outside on the porches; we let Karl be in charge of that. He’ll hang his own art, or he may ask Fred, or Brianna, or Honor,” Michele says. “Karl paints everything, including pieces of furniture. He makes everything look magnificent…every fireplace is painted and every one is different…he’s the man.” The Seekings give him carte blanche access to their home; “it’s a certain level of trust,” she says. We walked into one room that Smith had entirely transformed; “we went to Argentina, and came home and this is what we had.” The walls are covered with silhouettes of the Charleston church steeples and a psychedelic, celestial mural covers the ceiling. Michele jokes that she always warns guests not to drink too much before they turn in. 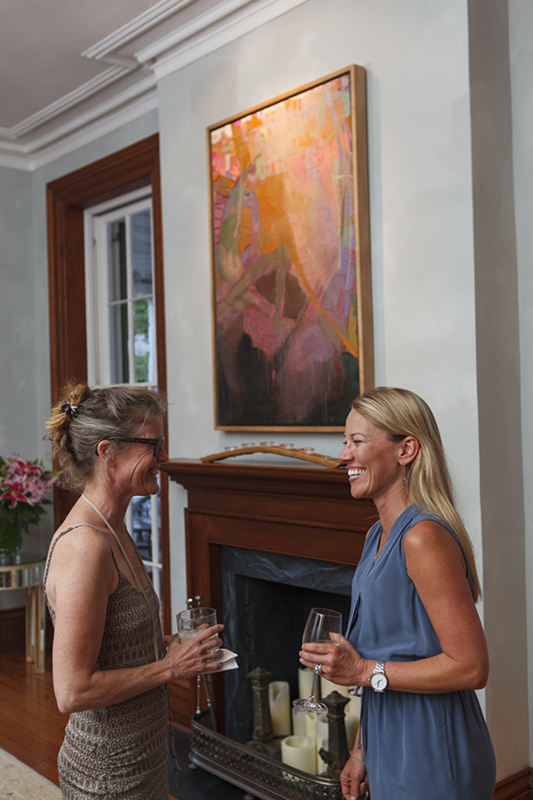 As an active board member of the Gibbes Museum of Art, Michele was asked to chair the Gibbes’ Closing Renovation Celebration. She was tasked with creating an event that would reach out to the community and let everyone know that while the doors may be physically closing, the museum itself will remain vibrant through pop-up exhibitions and programming. It was a dynamic event, and she credits the museum’s wonderful staff and volunteers for its success. “If you’re into arts and culture, you’re in the right place,” she says. “Your art museum should be a focal point of your community and be a part of the community, it’s important…All the studies show that when you have a thriving art museum and art community, it makes your community itself better,” she says. We couldn’t agree more. Posted in Visual on July 1, 2015 (Summer 2015) by admin.